DESTIN, Fla. (April 3, 2019) – The Henderson, a Salamander Beach & Spa Resort, will host its second Sweet Sunday event on Sunday, May 12, from 1 to 4 p.m. Titled “A Mother’s Day Market,” this elevated Farmers Market, anchored by The Honey Hutch, will celebrate mothers while also raising money for a worthy community cause, The Sonder Project. Guests and their moms are invited to the luxury resort to shop from a variety of merchandise, crafts and produce from local artisans, while enjoying a summer-themed mimosa bar. Vendors include 30A Barks, 30A Candles, Anne Hall Designs, Clean Juice, Gnarley Fish Prints, Happy Silk Scarves, Lil Plant Shop, Mary Ellen DiMauro, Merry Beth Myrick Designs, Soireé, Swell Pops, The Salty Sparrow, and The Shard Shop. There will also be live music performed by Chip Lyons, a photo backdrop by Proffitt Home Services with photography by Alissa Aryn Commercial, décor by Mingle, and signage by Eloquent Signs. For the kids, there will be face painting and crafts provided by Abrakadoodle Art Education as well as balloon sculpting and magic by Captain Davy. For the gentlemen, Luke Bryan’s cigar shop on 30A, Shore Thing Cigars, will be in attendance offering premium cigars for purchase. New to this event, guests will have the opportunity to bid on silent auction items comprised of specially crafted items created by each of the vendors in attendance. Items will include custom artwork, extravagant gift baskets, and a deluxe stay at The Henderson including room accommodations, spa treatments, and more. One hundred percent of the proceeds from the newly added silent auction will benefit The Sonder Project. 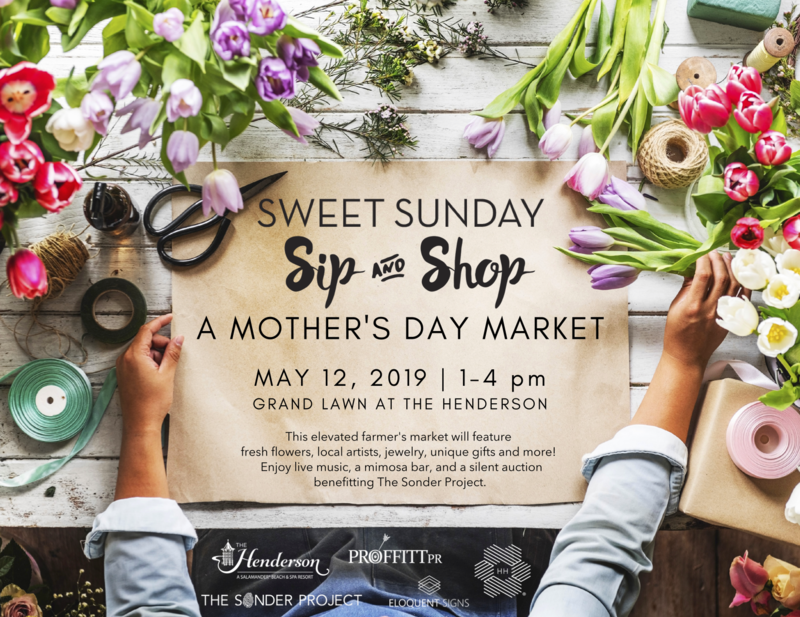 The public and guests of Sweet Sunday are also invited to attend The Henderson’s special Mother’s Day Brunch in the Crystal Ballroom at 10:30 a.m. or 1 p.m. before heading downstairs to the market. The cost for brunch is $75 for adults, $24 for children 5-12 years old, and free for children 4 and under. Sweet Sunday was created in 2018 to feature local artisans and vendors from around the Emerald Coast, showcasing their specialized craftsmanship. The main anchor of the event, The Honey Hutch, is a mission driven company founded by Destin local, Amy Wright, that offers pure raw honey and body care products made from simple, ethically sourced, wholesome ingredients. Wright will be at the event to help support The Sonder Project, a global non-profit charity she has partnered with that focuses on education, clean drinking water, deworming, and honey bee related agriculture. After Hurricane Michael, The Sonder Project has also had an enormous local impact on the affected areas by raising money, clearing debris, and serving hot meals to those left devasted and without the basic necessities. The event is family and dog friendly, and complimentary to attend. To stay up to date on other Henderson Signature Events like the resort’s Facebook page at https://www.facebook.com/HendersonBeach/.